BT has announced a new plan that further signals its intent to get into the mobile broadband space as well as connecting our home PCs to the internet. 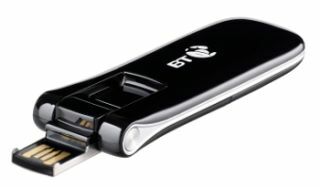 Users of BTs new Total Broadband package will pay £15.65 per month and get up to 8Mb broadband in the home as well as 1GB of data via a mobile broadband dongle as well. However, this deal is quoted using BT's basic package, which means just 10GB of data at home per month, but also a free Home Hub as well. The USB dongle is a basically an add-on to the package, so you have to pay £49.99 for the dongle and you add another six months to the deal by getting the 1GB of data. However, whack it up to Option 3 with unlimited data, ans although you'll be paying a shade under £25, there's unlimited home data on offer as well as just a tenner for the dongle. Switz swoo. So if you want a spot of mobile browsing but need some home time 'net fun as well, then you should check out the deal that also gives you 250 mins of Wi-Fi per month too, and includes BT's Connection Manager to work out whether 3G or Wi-Fi would be faster or cheaper.